April 01, 2018 There have been a tremendous volume of inquiries and activity around our innovative Cryptocurrencies sentiment feed! Bitcoin sentiment is currently in production and available through Thomson Reuters, and cryptocurrencies sentiment is not yet released (although the Beta version is available for vetting). Please submit inquiries through the Contact form on our website. March 31, 2018 We had a wonderful time seeing clients in Singapore, Tokyo, Hong Kong, London, Frankfurt and Zurich this month! Than you to everyone for your hospitality! March 25, 2018 We are presenting on "The Psychology of Bubbles" at the forthcoming “AI, Machine Learning and Sentiment Analysis Applied to Finance” on 27 – 28 June 2018, London. March 20, 2018 We'll be at Consensus 2018 at the Streamr Pavilion in NYC on May 14-16th! Looking forward to seeing our crypto compatriots there! The universe of numbers that represents the global economy. Millions of hands at work, billions of minds. A vast network, screaming with life. An organism. A natural organism. My hypothesis: Within the stock market, there is a pattern as well... Right in front of me... hiding behind the numbers. Always has been. ~ Max Cohen in Pi (1998, movie), Artisan Entertainment. The movie "Pi" follows Max Cohen - a genius mathematician - as he searches for a single number that will unlock the universal patterns found in nature. As he hones his understanding in the stock market, he is pursued by desperate bankers, violent gangsters, and militant rabbis. Each group wants to steal his master key so they can unlock the patterns of most relevance for them. Many investors search for such a simple solution. Like Cohen's search in Pi, the pursuit is often steeped in mathematics, and it can feel circular - and even maddening - at times. Yet for cryptocurrency investors, where prices are fed by information flow and waves of crowd behavior, there is perhaps no better place to seek such a simple natural pattern...if one truly exists. The story of crypto is a psychological one. It’s a story of dreams - of freedom and independence from oversight, of anything-goes libertarianism, and of friendly adult men sporting my little pony t-shirts. And it's also a FOMO-inspiring story of sudden life-changing wealth. These factors conspire to make cryptocurrencies one of the most remarkable and fascinating social events in human history. Today's newsletter examines the sentiments behind cryptocurrency prices. We use images and quant research from our subscription research portal and the Thomson Reuters MarketPsych Indices (TRMI). Restate my assumptions: One, Mathematics is the language of nature. Two, Everything around us can be represented and understood through numbers. Three: If you graph the numbers of any system, patterns emerge. Therefore, there are patterns everywhere in nature. Evidence: The cycling of disease epidemics;the wax and wane of caribou populations; sun spot cycles; the rise and fall of the Nile. So, what about the stock market? I first noticed a bitcoin bubble when the price rose from $2 to $20 in - if I recall correctly - 2011. The next significant bump was in 2013, as described in this 2013 newsletter of ours. Later in 2013, another bubble emerged in bitcoin. In its funny way, bitcoin is a bubble-producing machine. Using prices from coinmarketcap.com (which start in mid-2013), we can see the two 2013 price bubbles in the chart below using the swings in social media buzz. Interestingly, both 2013 bitcoin price bubbles appear fueled by investor attention, as embodied in the increasing social media buzz. For the most recent price bubble in 2017 (below), we see a similar phenomenon in which rising social media buzz was associated with the price rally. While buzz seems useful as a marker of increasing attention while the price goes up, buzz also spikes higher when the price goes down. It makes intuitive sense that bubbles arise alongside increasing investor attention - especially for a scarce asset like Bitcoin. But if buzz is high when the bubble ends - which it is - then our bubble spotting tool is not complete. We must look elsewhere to understand how to time a bubble top. My new Hypothesis: If we're built from Spirals while living in a giant Spiral, then is it possible that everything we put our hands to is infused with the Spiral? As Max Cohen speculates in the quote above, there seem to be cycles in financial markets. Robert Shiller, 2013 Nobel laureate in Economics, won the Nobel prize in part due to his work on the most obvious cycle - asset bubbles. But Shiller's work on bubbles was not easily quantified (although we're trying). To find a more mathematical approach, we can look to a seminal paper on the mathematics of bubbles, “Crashes as critical points" (Johansen, Ledoit, and Sornette, 2000). The authors apply a log periodic power law (LPPL) model to financial time series during bubbles. This model identifies when a bubbly asset price has hit a critical point and is likely to reverse. Marco Bianchetti, Camilla Ricci, and Marco Scaringi applied the LPPL model to cryptocurrency markets. They found that potentially useful bubble signals were indeed generated. Once can see the bubble warning signals from a LPPL model (OLS) for bitcoin graphically from their paper below. Bianchetti, M., Ricci, C. and Scaringi, M. 2018. ”Are cryptocurrencies real financial bubbles? Evidence from quantitative analyses.” SSRN. So it appears that te LPPL mathematical signals are useful in identifying the tops of bubbles. It would stand to reason that media sentiment may supplement the mathematics of bubble behavior. Sometimes obsessive focus and effort burns us, and we are forced to cede with only scars to show for our efforts. But sometimes intense focus pays off. In 2010, as a result of intense effort, we developed a sentiment metric to quantify the characteristics of speech in the media at the tops of bubbles versus after the collapse. We originally called this metric the "Bubbleometer," but we later changed its name to the "MarketRisk Index." The construction of this index is described in chapters 17 and 18 ("Timing Bubble Tops") in our book "Trading on Sentiment" (Wiley, 2016). This index has been quite useful in timing reversals during bubble tops, including for bitcoin. The charts below are similar to our book's charts on the Nasdaq bubble (1999-2002) and the China stock bubble (2014-2015). One of our clients, NN Investment Partners with $230 billion AUM, manages long only equity funds out of Amsterdam (they are a spin-off from ING Bank). They have found - and reported in the Dutch media - that when market sentiment becomes more negative after a price rally, then a correction is likely to ensue (a risk-off signal is generated). We see similar confirmation in the bitcoin charts below. When sentiment declines during a bubble top, risk aversion is kicking in, and prices subsequently pull back. It's fair to say that I'm stepping out on a limb, but I am on the edge and that's where it happens. 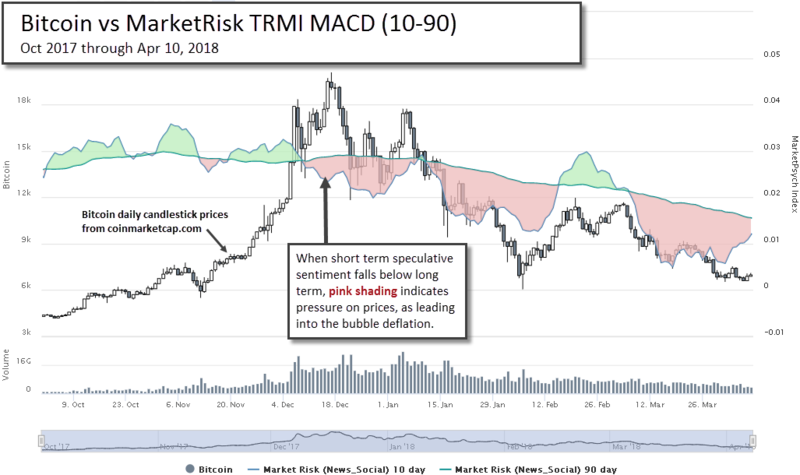 The above charts suggest that if the price has risen, and attention (buzz) is high, then a shift to more negative sentiment may foretell a downturn. The Ancient Japanese considered the Go board to be a microcosm of the universe. Although when it is empty it appears to be simple and ordered, in fact, the possibilities of gameplay are endless. They say that no two Go games have ever been alike. Just like snowflakes. So, the Go board actually represents an extremely complex and chaotic universe. ~ Sol Robeson, Pi (1998, movie), Artisan Entertainment. As Sol Robeson noted, such indicators of imminent bubble reversals are not foolproof. But I would argue that they are probabilistic - there is an order in this seeming chaos, although each time it is expressed in a slightly different way. ~ Sol Robeson in Pi (1998, movie), Artisan Entertainment. 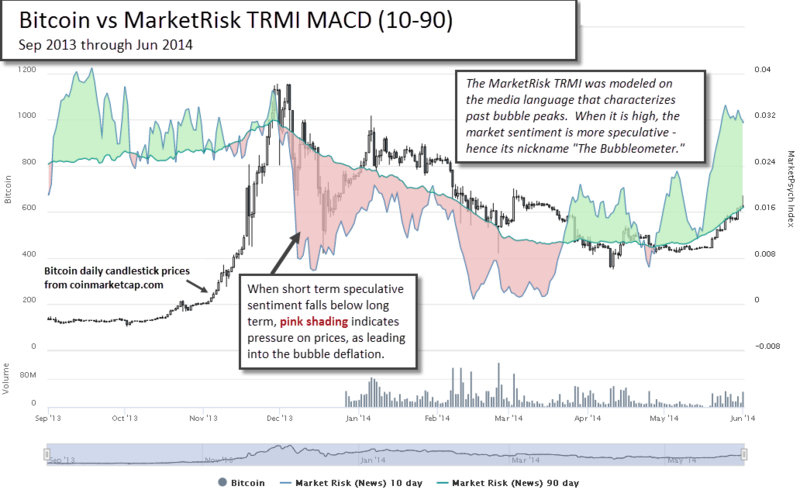 MarketPsych's Head of Research, CJ Liu, performed a series of regressions on the individual bitcoin and ethereum TRMI over daily, weekly, and monthly periods. Below I'll show some interesting results from the daily and weekly files. Based on the regressions, it appears that media sentiment has stronger short term predictive effects on prices, as might be expected. The next few paragraphs have a lot of numbers, and for most people these aren't be useful, so non-quants should feel free to skip ahead. Daily regression results for today's bitcoin sentiment index value (under "Variable") during the period we have daily pricing data from mid-2013 to the present are below. The average index value for the prior 24 hours was snapshot from our hourly data 1 hour before midnight UTC, and then it was regressed against the following day's percentage price return for bitcoin. Sources derived only from news are labelled "mp_News", and those only from social media are "mp_Social", and from the aggregation of news and social media are "mp_News_Social." You can see below that social stress has the most statistically significant correlation with next day bitcoin price change based on the p-value (lower is more significant), but the coefficient is negative/inverse. That means that high social stress on one day predicts a negative price return the following 24 hours in bitcoin. 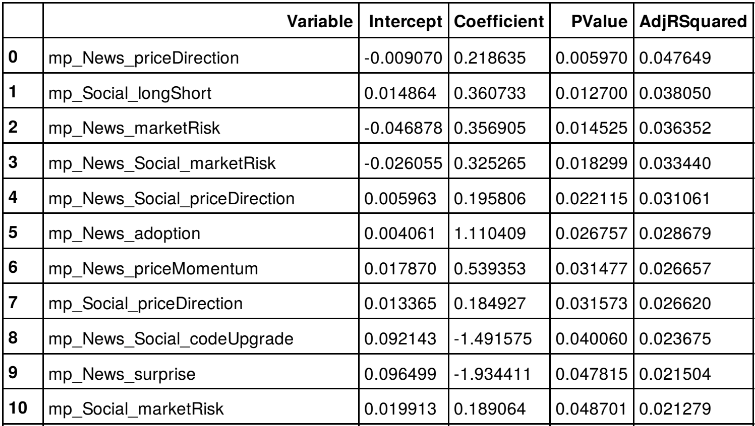 In row #2 we see that News of the priceDirection (reports on whether the price is rising or falling) correlate positively with future price returns. If news reports the price is rising, then the next day it tends to continue rising (and vice versa for the downside). Weekly correlations also appear interesting. The following table shows weekly regression values for ethereum (ETH) prices versus the prior week's average sentiment scores. The price history is even shorter on ethereum versus bitcoin, and perhaps because of the cycle of weekly upwards and downwards trends, the prior week's news reports on price direction are most highly correlated with the next week's price action. "The number is nothing! It's the meaning. It's the syntax. It's what's between the numbers. You haven't understood it. It's because it's not for you! I've got it. I've got it! And I understand it and I'm going to see it. Rabbi, I was chosen!" Since we don't have a long price history of cryptocurrencies, we will look at a simple long-term predictor of stocks, and transfer that to individual cryptocurrencies. One of the more consistent predictors of stocks in a long-only strategy is to buy the most positive stocks in a given year and hold for the following 12 months. This is due to positive sentiment fueling positive price momentum. 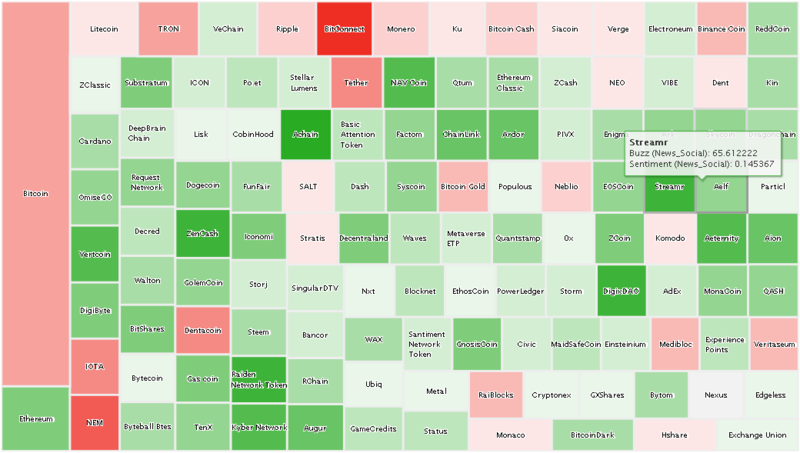 The below heatmap shows the most positively viewed cryptocurrencies according to the media over the past 3 months. The greenest cryptocurrencies are the most positive. (This is not a recommendation to buy - there are many other factors at play). There are probably better predictors than outright sentiment, like the level of technological innovation at each coin, but until we have a longer history, we won't be able to have statistical confidence in such longer term indicators. Sol Robeson: "This is insanity, Max." Maximillian Cohen: "Or maybe it's genius." The ending of the movie Pi leaves us with a dilemma - can being a mathematical genius actually help us decipher a dynamic organism like a financial market - or do we become too attached to using the mathematical tools at our disposal, missing out on the bigger - human - picture? We are doing our best to understand patterns in market psychology, but the patterns are not simple. Most images in this newsletter are screenshots from our online portal, fed by our Thomson Reuters MarketPsych Indices (TRMI). The TRMI are deployed globally to monitor the human side of financial markets. The TRMI measure and deliver real-time market psychology and macroeconomic trends from thousands of news and social media sites. If you're an academic interested in data for research, please reach out for access. If you represent an institution, please contact us. The commercial Thomson Reuters MarketPsych Indices dataset covers 45 currencies (including Bitcoin), 62 countries' fixed income products and stock indexes, 12,000+ companies and stocks, 36 commodities, 187 countries, and 130+ cryptocurrencies. Our sentiment product for 130+ cryptocurrencies will be ready for testing shortly, with formal launch scheduled on June 30th. The data is already populating our quant research, website charts, and heatmaps, as seen throughout in this newsletter. We are developing a mathematics of information flow and human behavior. We hope these efforts reveal new truths about the interrelationship of minds and markets. But we always must keep in mind the wisdom of Sol Robeson, "That is the truth of our world, Max. It can't be easily summed up with math." (Pi, 1998). Johansen, A., Ledoit, O. and D., Sornette. 2000. “Crashes as critical points.” International Journal of Theoretical and Applied Finance, 3, no. 2: 219-255. Pi. Dir. ‎Darren Aronofsky‎, 1998. Artisan Entertainment. Copyright © MarketPsych 2018 , All rights reserved. DISCLAIMER Your use of this the content contained in this publication is at your own risk. Opinions expressed by MarketPsych, LLC ("MarketPsych") are based on sources believed to be reliable and are written in good faith, but no representation or warranty, expressed or implied, is made as to their accuracy or completeness. MarketPsych does not receive compensation of any kind from any companies that may be mentioned in MarketPsych. Any opinions expressed are subject to change without notice. MarketPsych is not responsible for errors or omissions, or responsible to keep any information up to date or to correct any past information. Any recommendations contained in this material are for educational and information purposes only and should not be construed as a solicitation to enter into an investment advisory relationship or to purchase any security or other financial instrument. MarketPsych does not provide customized or personally tailored advice or recommendations through this publication. Advice and trading signals displayed contained in this material are of a generic nature and are not tailored to the specific circumstances of any visitor or subscriber. You should use any information gathered from this publication only as a starting point for your own independent research and decision making process. Any specific investment recommendations or advice contained or referred to in this material may not be suitable for all investors. You should carefully consider whether any specific recommendation is suitable for you in light of your financial condition. You are advised to conduct your own due diligence and seek advice of a qualified professional when it comes to making investment decisions for your own account. The risk of loss in trading securities and other financial instruments can be substantial. No trading program can offer the potential for profit without a corresponding risk of loss. The ability to withstand losses and to adhere to a particular trading program in spite of trading losses are material points which can adversely affect investor performance. You may sustain a total loss of you investment. Past performance is not necessarily indicative of future results. MarketPsych is not responsible for the success or failure of your investment decisions relating to information or services presented herein. MarketPsych reserves the right to refuse its services to anyone, either current subscriber or potential subscriber, with or without any reason or for no reason. MarketPsych reserves the right at any time to modify this disclaimer and risk disclosure without notice.